Local residents who use Simms Millennium Park will notice some significant changes since Project Watershed completed salmon habitat improvement work in the park this summer. During the very hot and dry month of August the Project Watershed team completed the construction phase of the project, which has been many years in the planning. As part of the project some Alder trees had to be removed and the area re-contoured to allow equipment access to the site. These trees will be replaced with conifers. The endeavour included the removal of an old culvert connecting the Courtenay River through the park into an inner pond area. This culvert was replaced with a larger fish-friendly culvert installed at a lower elevation so that fish will have more access during a variety of tide cycles. In addition another large culvert was installed at the end of the inner pond connect through to the Courtenay Slough. 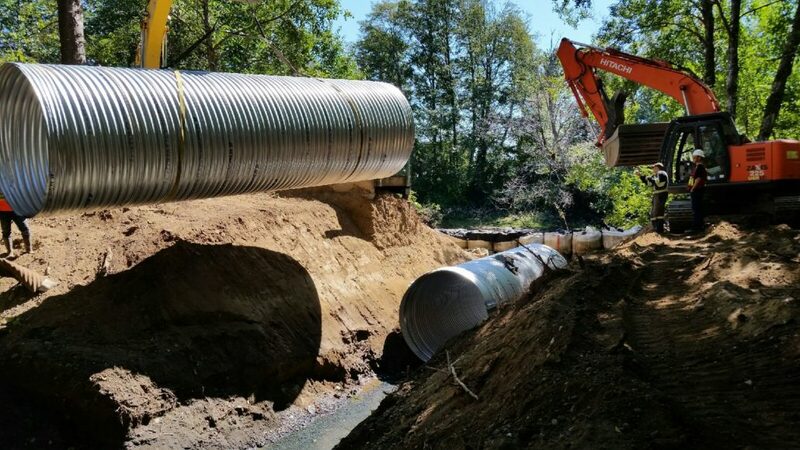 This installation of the two culverts created a true flow-through channel and has completely changed the hydrology of the area, resulting in improved circulation and flushing which has led to better water quality. Already adult salmon and trout have been observed moving through the new culverts and utilizing the channel. 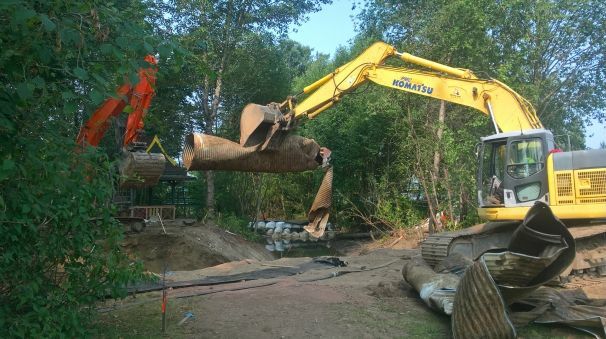 Photo of Parksville Heavy Equipment removing the old culvert. Volunteers from the community helped salvage fish from the area before the start of construction, and were also on hand to keep the public out of the active work zone during construction and explain the project objectives to those interested. The K’ómoks First Nation Guardian Watchman and their summer students helped with site preparation and the City of Courtenay Parks staff provided tremendous professional support throughout the project. Of course the project could not have been brought to fruition without the financial support of the Fish and Wildlife Compensation Program, Fisheries and Oceans Canada and the Habitat Conservation Trust Foundation. 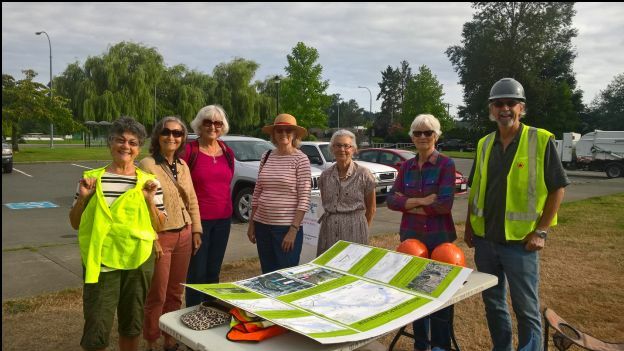 Volunteers Bonnie Bain (far left) and Dan Bowen (far right) in yellow vests explain the project to members of the public. Photo showing the installation of the new culvert. October 24 to the 28th– Volunteers needed to help plant native conifers, other native trees, plants and shrubs. All together we have almost 900 plants to get in the ground, which means will need lots of volunteer help replanting the area. Bring a shovel if you can, otherwise we’ll provide you with one. We will arrange for some snacks for volunteers, but bring a lunch if you plan to stay the whole day. We will meet at the Simms Millennium Park parking lot (50-5th St.), in front of the Rotary Pavilion. If you arrive late walk down one of the trails on the west side of the park and you’ll see us planting on either side of the channel. Thanks for your support! Please contact Jennifer Sutherst at: estuary.projectwatershed@ gmail.com or 250-703-2871.